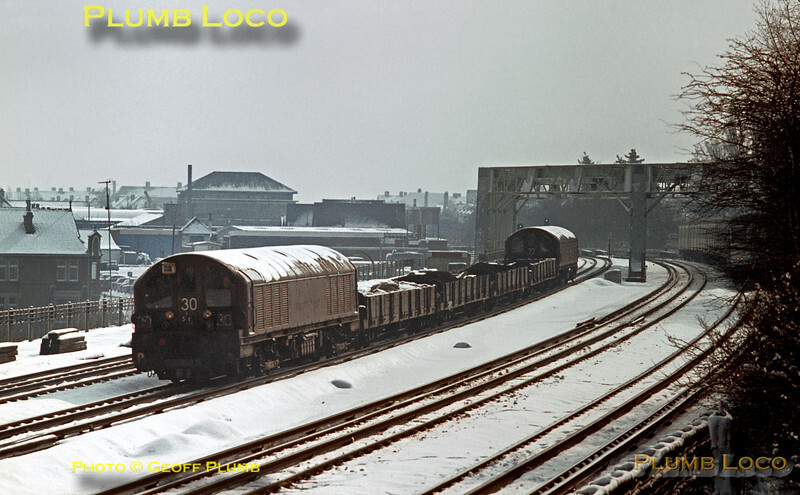 Two LT Battery Electric locos, Nos. L30 and L22, "Top & Tail" the spoil train which ran from Neasden depot to the tip at Croxley, via reversal at Watford, the train previously regularly hauled by ex-GWR "Pannier Tanks". They have just crossed the girder bridge over the road just south of Northwood and are about to be overtaken by a fast Amersham train of A60 stock. A snowy day in March 1970. Slide No. 4719.